The sign of Scorpio takes place during the time of year which follows the Autumn harvest and those born beneath this most intense of Water signs have an inherent ability of making the most of their resources, even should those resources be at their barest minimum. Maria Salomea Skłodowska was no exception to this Scorpionic rule. Upon entering this plane of existence on November 7th, 1867, Maria was born into a world greatly lacking in opportunity for her brilliant mind that was restrictive in nearly every way due to her ethnicity, financial status, and gender. Maria was born in Poland but her country was occupied by the Russian Empire at the time of her birth and the area where she hailed from, “The Kingdom of Poland”, was merely a puppet state that answered to Tsarist Russia during the years which made up her childhood. Maria’s identity as a Pole as well as speaking her native language of Polish were sources of problematic tension while growing up under Russian rule. Both sides of her family had suffered dearly for their Polish patriotism and heritage, with both her mother and father’s relatives having their land and money confiscated by the Russians. Scorpio is otherwise known as “the sign of the survivor” and upon hearing of such difficult beginnings, I sometimes wonder if those born beneath this most tenacious of signs choose to enter this world in as restrictive an environment as possible in order to discover their inherent abilities to survive and persevere. At the latter half of the 19th century, education for Polish women terminated at the end of secondary school. Despite graduating at the top of her class at the age of 15 and being awarded a Gold Medal for high honors, the path of further education for Maria Skłodowska abruptly stopped due to women not being given access to Polish universities. But did that deter our most determined of Scorpios? Hades no! Scorpio is the sign that deals with “what lies beneath”. Anything that is below the surface, covert, or underground falls beneath the domain of the middle of the water signs. Maria Skłodowska was determined to continue her education and indeed the young Scorpio did – through two of the most covert ways possible at that time. Upon finishing secondary school, Maria’s family faced a major financial hardship which the young Scorpio transformed into an opportunistic advantage. Fired for his “pro-Polish” sentiments, Maria’s father lost his job teaching Math and Physics at a boys Gymnasium in Warsaw. Despite the financial difficulties imposed upon him, the scientific equipment Maria’s father used to teach his Physics classes were brought home, much to the delight of his youngest daughter who began to self-educate herself. The other route of Maria’s education was far more risky. Scorpios enjoy having an aura of mystery surrounding them, and Maria was forced to surround herself in both mystery and secrecy upon entering “The Floating University”. This mysterious institution of learning with the Harry Potter-ish name was an illegal night school with a pro-Polish curriculum that regularly changed locations so as not to be discovered by Russian authorities. Students who attended the Floating University did so with the highest level of secrecy, each taking turns teaching each other their subjects of specialty. Although no substitute for a European university, Maria was able to get a taste of progressive thought and was introduced to new developments in the world of late 19th century science. Even with what she taught herself at home and the courses taken at the Floating University, Maria knew if she was to seriously advance her education, she would need to leave her beloved Poland. So off to Paris the young Scorpio went. Upon registering for classes at France’s famous Sorbonne, young Maria now became “Marie”. Despite the thrill of attending such a prestigious school, Marie’s fears were confirmed regarding her educational deficiencies. She not only had to make up for lost time with her Math and Science studies, the Polish teen had to adjust to all of her classes now being taught in French. With every bit of saved money going towards school, Marie existed on next to nothing, all for the sake of her education. Having no money to heat her tiny apartment in Paris’ Latin Quarter, the Scorpio would wear nearly every piece of clothing she owned, layering one on top of the other just to stay warm. Having no money for food, the Scorpio would often faint from hunger, immediately resuming her work after being revived. Despite having to withstand such brutal hardship, Marie remained true to her sign by bravely adhering to a principle she herself mentions in the quote which opens this piece – “perseverance“. By the end of 1893, Maria Skłodowska’s hard work was given tangible affirmation with her receiving not one, but two Master’s Degrees – one in Mathematics, the other in Physics. In the spring of 1894, Marie was introduced by a Polish colleague to a Frenchman who was a pioneer with his work on magnetism named Pierre Curie. Born beneath the Venus ruled sign of Taurus on May 15th, 1859 that functions best when in love, Pierre Curie had all but given up hope of ever finding a romantic partner due to the complete lack of scientific interest he consistently encountered with the Parisian women he tried to date. Those born beneath the signs of Taurus and Scorpio have a manner of speech that is simple, straightforward, and to the point, and both signs reputedly abhor any variation of small talk. Even with that astrologically said, it became more than abundantly clear that this particular Scorpio and Taurus had numerous things in common to discuss upon first being introduced to one another. The Scorpio who had endured so much hardship fell deeply and madly in love with a fellow scientist born beneath her polar opposite sign who also shared her soul’s inner most passions. Together as a team, the Taurus Scorpio duo of Pierre and Marie Curie changed the course of modern Science. Through their efforts, Chemistry’s Periodic Table was expanded with the addition of two elements discovered by the polar opposited pair – Radium and the element which Marie named after her homeland, Polonium. 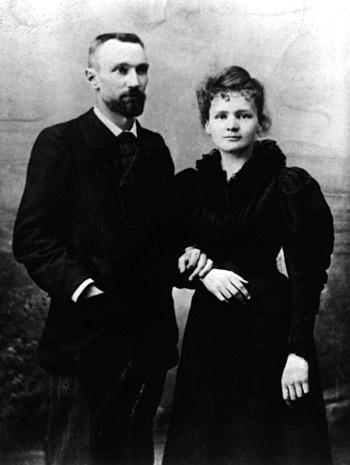 Along with Marie Curie’s distinction of being the only woman to have won the Nobel Prize in two different fields of study (Physics, 1903, & Chemistry, 1911), the husband and wife investigatory team of The Curies share the distinction of being the only married couple to jointly be awarded a Nobel Prize which they won together in 1903 in the field of Physics. Even though the Curies gained international fame with their award winning work, neither let their far reaching notoriety go to their head. The icon for this chapter shows Marie and Pierre on their wedding day which took place on July 26th, 1895. The couple chose to forgo the frills associated with a traditional wedding by being married in a simple civil ceremony and instead of an elaborately expensive white wedding gown, Marie chose a midnight blue dress which happened to merge the colors associated with both her and her husband’s signs (Taurus’ Pastel Blue + Scorpio’s Black). Always the Scorpio who made the very most of her resources, Marie Curie didn’t allow her wedding dress to serve the solitary purpose of merely getting married. The Scorpio put her matrimonial clothing to full use by having it serve as a laboratory gown in the subsequent years following her wedding. 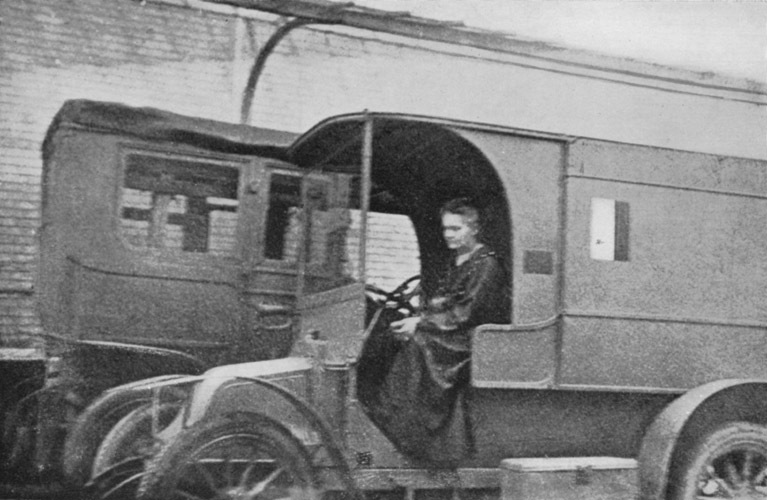 In spite of her petite frame standing slightly beneath 5 feet, Marie Curie single handedly developed and drove mobile X-ray vehicles to the front lines of battle during World War I . Although Pierre Curie abruptly left this world after a horse and buggy accident at the age of 46, Marie Curie carried on as a ground breaking scientist in her own right During World War I, the fearless Scorpio took her pioneering work in radioactivity directly to the front lines of battle. With only a military doctor and her daughter Irene to assist her, Marie Curie developed and oversaw the world’s first “radiography units”. These mobile X-ray vehicles moved between the French front lines of combat and nearby field hospitals, greatly assisting doctors in finding and removing bullets and shrapnel from the bodies of wounded soldiers. It’s estimated over a million afflicted soldiers were treated with Marie’s X-ray units. The bravery displayed by many a Scorpio born person can mainly be attributed to their sign’s inherent awareness of death. Ironically, the scientific discovery which Marie Curie dedicated her life into uncovering would also prove to be the very thing that would end it. Aware there were health risks associated with consistent exposure to radiation, the Scorpio was undaunted with her work involving the element she discovered along with being exposed to X-rays without protection during her years of invaluable service during the First World War. Marie Curie died at the age of 66 from complications due to radiation poisoning. It must be noted Madame & Monsieur Curie weren’t the only Taurus Scorpio team of notoriety in the family, Pierre and his Scorpionic brother Jacques Curie made scientific history when the polar opposite signed brothers discovered “piezoelectricity”, an electric energy created as a result of applied stress. And the accolades of intellectual brilliance didn’t end with just Marie and Pierre. The Curies had two daughters, both attaining notoriety in their own right. Eve Curie was an acclaimed writer and journalist and Irene Curie not only followed her parents’ footsteps of becoming a scientist, she, like her famous mother was awarded the Nobel Prize in Chemistry in 1935.